I’ve never done this before, but it can’t be too hard, right? In the midst of looking at fantastically done quilts, mainly done on longarms at the Machine Quilter’s Showcase, I am going to show you here something that I have A) finished, B) hangs on my wall C) truely love and D) has walking foot quilting. This picture is probably my best full on picture which was taken while at the show we did back in July of last year. Which is why the paper is pinned on the left of it. I took a simple pattern about Daisies and duplicated, rotated, enlarged and changed some of the flowers and leafs. I designed my own flower pots. The birds I copied applique patterns from Award Winning Applique Birds. I decided they lived in the patio too. The quilting is cross hatch along the blue background, as my original idea was looking through a window at the birds on a hypothetical back porch. For the longest time I was confused weather these were daisies or sunflowers, but in the end they looked like sunflowers more. I found out there are lots of centers of sizes of sunflowers out there in the world, and these were closer to some type rather than others. I offer up my simple quilt in the festival as my first ever entry to the 2012 Spring Quilt Festival. I am a little disappointed that there is realistically no reason for me to be at quilt market as it’s happening in my own backyard (theoretically). But my day at Machine Quilter’s Showcase yesterday was fantastic and I’ll share more about all of it really really soon. At least that’s my hope! If you happen to want to attend a quilt show with fantastic quilting and you’re still in Kansas City, pop down to Overland Park tomorrow 9-3 and I’m sure you’ll have a good time! Lovely – the birds are sweet! 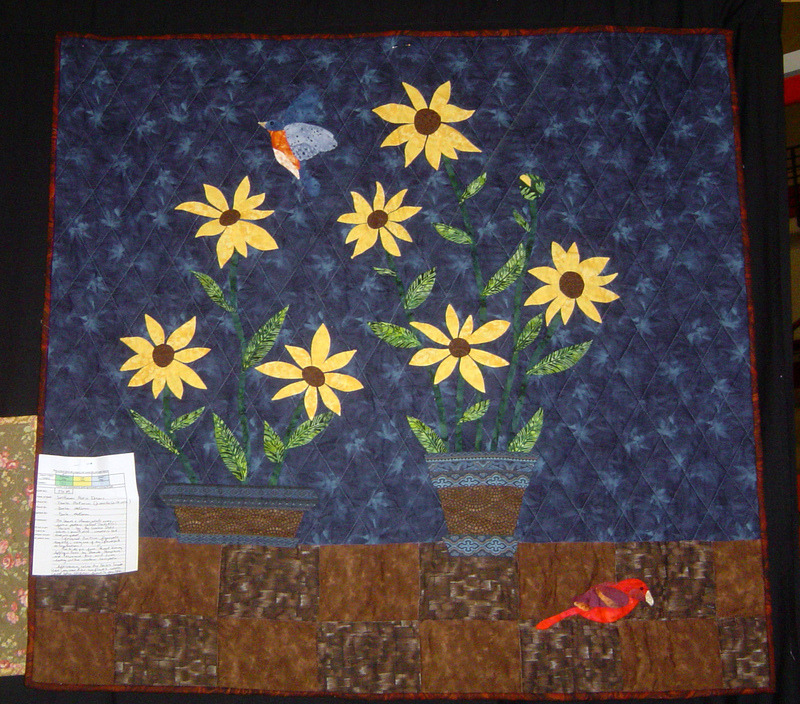 Lovely quilt – the flowers and birds make it special. Great design. Thanks for sharing.